If you are looking for a unique Bible story experience, Love Letters from God is worth looking for. It is a really special book, geared toward young children, but one that all ages will enjoy. 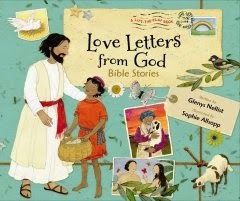 Love Letters from God Bible Stories by Glenys Nellist is a hardback picture book that includes interactive features, lots of color, and fun fonts. It is visually beautiful and inviting, offering opportunities for kids to open "letters" after each story. The illustrated pages remind me of scrapbook pages, with lots of things to look at and enjoy. As a read-aloud book, Love Letters from God keeps children busy looking as the stories unfold. Each story ranges from one to two pages in length, featuring content from both the Old and New Testaments, such as the Creation, Daniel in the lions den, Jonah and the big fish, Jesus feeding the people, and much more. Parents can personalize the book by adding their child's name at the top of each letter. When children open each letter, they have a message from God related to the message of the story. At the end, children have an opportunity to write their own letters to God. This sweet picture book is a wonderful gift idea, unlike any other Bible story book. It is sure to become a treasured heirloom.